The secret ingredient in the world's fastest marathon shoe lies primarily in its squishy midsole, not in its controversial carbon fiber plate, new CU Boulder research suggests. "This paper demonstrates that the bulk of the energy saved through this shoe comes through its softer, better foam," said senior author and integrative physiology professor Rodger Kram. "The carbon fiber plate is just a cherry on top." The study, published today in the journal Sports Medicine, marks the latest scientific chapter for the Nike Vaporfly 4%, the fabled racing flat worn by five of the six top finishers at this month's New York City Marathon and the two men who toppled the marathon and half marathon world records earlier this fall. 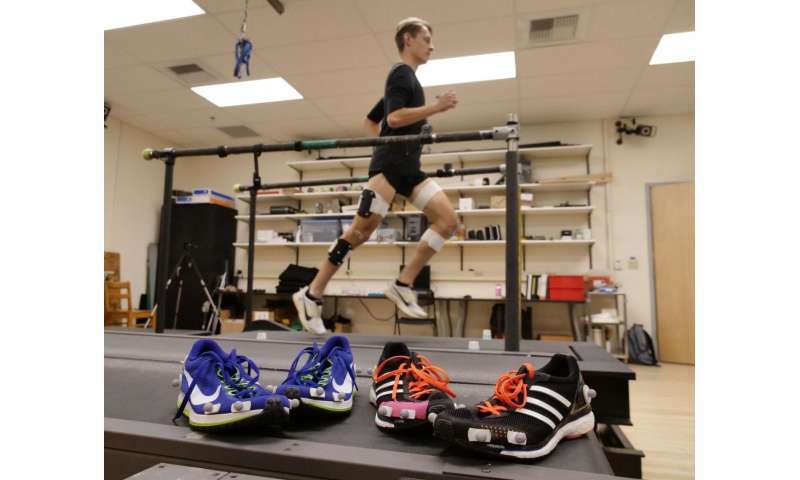 Previous CU Boulder research found that the shoe—which features a thick foam midsole with a spoon-shaped plate inside—enables athletes to exert, on average, 4 percent less energy while running. That finding inspired the shoe's name. For a four-hour marathoner, 4 percent savings translates to almost 10 minutes faster. For a world-class 2:03 marathoner, it could make the first sub-two-hour marathon possible. To find out, Shalaya Kipp, then a graduate student in Kram's lab, enlisted 10 competitive male runners who wear a size-10 shoe and could comfortably run a 10K in under 35 minutes. 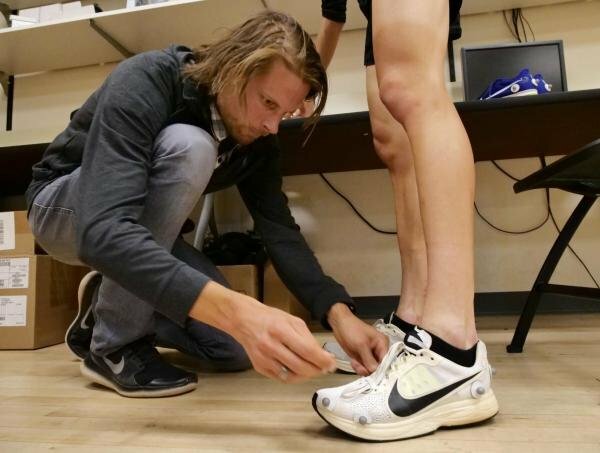 Kipp and lead author Wouter Hoogkamer, a postdoctoral researcher, placed reflective markers on the runners' legs and shoes, then had them run for five minutes on a treadmill at a six-minute-per-mile pace while a 3-D motion-capture system measured their joint mechanics. They also took measurements of the force with which the runners hit the ground and the energy returned with each step. 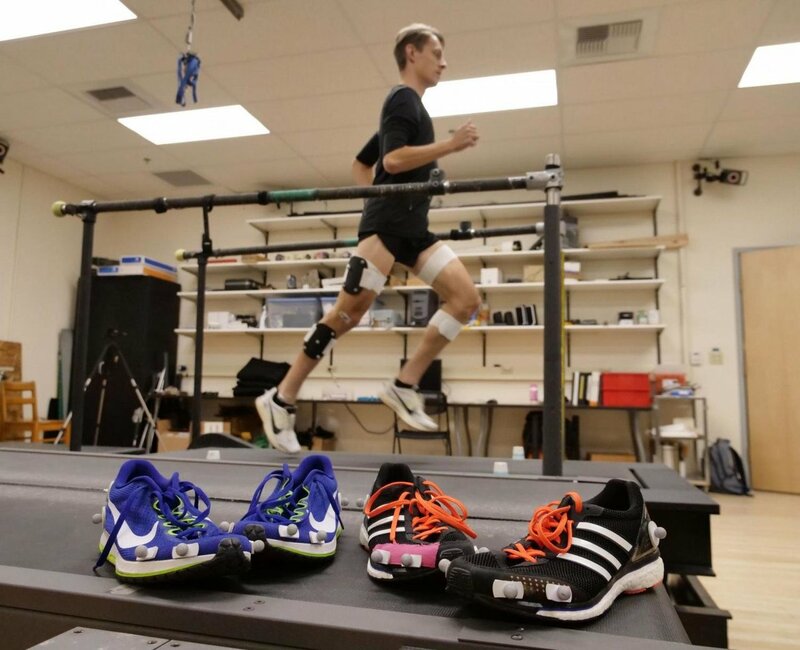 "We found that it is not one magic thing that explains the metabolic savings in this shoe, but rather a combination of a whole bunch of biomechanical factors related to the foam and the plate," said Hoogkamer. Contrary to what they expected, they found no difference in the runners' knee or hip joint mechanics between shoes. But they did find that those wearing the 4% shoes didn't have to exert as much muscular torque at their ankles, and thus the calf muscles did not have to do as much work. Further, the plate made the shoe less flexible and thus the foot muscles that stabilize the toe joints didn't have to work so hard. "This shoe doesn't give you energy but it prevents you from losing as much energy every time your foot strikes the ground," says Kram. "That can make a big difference." The shoe is the latest innovation in what some are calling an escalating "shoe arms race" as companies one-up each other in hopes of breaking the two-hour marathon barrier. In September, Kenyan marathoner Eliud Kipchoge officially broke the world marathon record in the 4% shoe, with a time of 2:01:39 at the Berlin Marathon. A month later, Abraham Kiptum broke the men's half-marathon world record in the shoes, clocking 58:18. "When we measured the energy stored and returned in the plate, we found it to be minuscule," said Hoogkamer, noting about 50 times more energy savings come from the foam. "Lots of shoes have foam midsoles and every foam has some spring action to it." Nike provided the shoes but this latest study was not otherwise funded by Nike. The research team hopes their research can lend scientific evidence to the ongoing debate over what constitutes unfair advantage in shoe design. More importantly, they hope it can help companies design better shoes for runners of all abilities. "The point of foot races is to see who can run the fastest and these new technologies help people to run faster," said Kram. His advice for marathoners gunning for a personal-record: Consider a resilient shoe with a thick cushion.